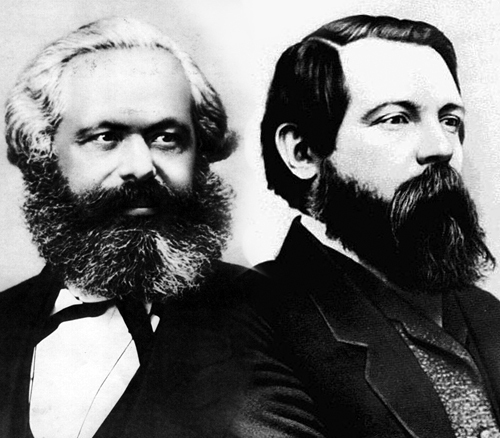 Karl Marx and Friedrich Engels via Wikimedia. How does one rate a classic? If one could only change the world in 30 pages or so! What always strikes me is that, much like Dr John Hewson's Fightback! policy from the early 1990s, most of the pamphlet has been implemented already (sans the revolution, and admittedly Hewson's work was considerably longer at 650 pages!). Nevertheless, of the ten "measures" (p. 20), Australia has, over time, implemented many of the plans through what, in some ways, still displays remnants of social democracy. However, as with Fightback!, and while many like to think it was all nonsense, much of it has been done or is still in the doing. Whether the great Internationale will die with the contemporary return to nationalism is a moot point when one considers the exponential increase in growth and power of "socialism with Chinese characteristics" (not to mention India, which is quite another story). But this probably won't concern me, at least in this life.